The Firebug team released Firebug 2.0.19. This is a maintenance release ensuring compatibility with latest Firefox releases. The beta channel on AMO is also updated. Firebug 2.0.19 fixes issue 8077. You might also want to read about Unifying Firebug & Firefox DevTools. The Firebug team released Firebug 2.0.18. This is a maintenance release ensuring compatibility with latest Firefox releases. Firebug 2.0.18 fixes issue 8030. The extension is marked as multi-process (e10s) compatible so, it isn’t blacklisted and users can continue installing it. This way Firebug can help users to easily migrate into built-in Firefox developer tools – in case it’s running in multi-process enabled browser. 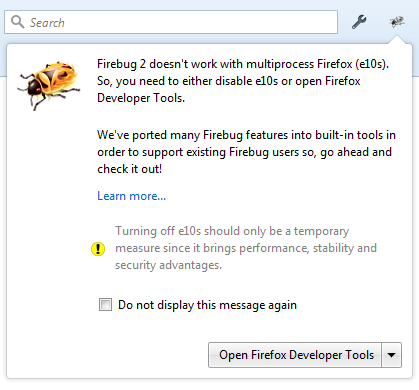 When opened in a multi-process Firefox, Firebug’s tools cannot be used. Firebug will then only assist the user with migration to Firefox’s built-in tools. The Firebug team released Firebug 2.0.17. This is a maintenance release ensuring compatibility with latest Firefox releases. Finally, read more about Unifying Firebug & Firefox DevTools. We have been working to unify Firefox Developer tools and Firebug for some time. From Firefox 49, we’ll be shipping Firebug.next built-in. For Firebug users this means many new features with the look and feel that you’re familiar with. Memory Panel – The Memory tool lets you take a snapshot of the current tab’s memory heap. Web Audio Editor, Shader Editor and Canvas – Developer Tools for debugging media-rich content on the web. Storage Inspector – The Storage Inspector enables you to inspect various types of storage that a web page can use (cache, cookies, local & session storage, indexedDB). Responsive Design Mode – Responsive Design Mode makes it easy to see how your website or web app will look on different screen sizes. Animation Inspector – The Animation Inspector displays animations in the page synchronized along a timeline, with a draggable widget you can use to move to any point in the timeline and see the page at that point. If you use the built-in Firefox Developer Tools, rather than Firebug, then you may like the DOM Panel and Firebug Theme that we’ve added in this merge. In addition we’ve ported some common Firebug extensions (PixelPerfect, FireQuery and HARExportTrigger formerly NetExport). And while we’re at it, you might like our new WebSocket Monitor extension. Firebug 2 doesn’t work in multi-process browsers (i.e. e10s) and converting it is too complex, so it will stop working when e10s is activated in Firefox. You will be able to disable e10s for a while to keep using Firebug 2, but this won’t last forever. The Firebug team released Firebug 2.0.16. This is a maintenance release ensuring compatibility with latest Firefox releases. Firebug 2.0.16 fixes the following issue: 8004. The Firebug team released Firebug 2.0.15. This is a maintenance release ensuring compatibility with latest Firefox releases. Firebug 2.0.15 fixes the following issues: 8000, 7998. The Firebug team released Firebug 2.0.14. This is a maintenance release ensuring compatibility with latest Firefox releases. Firebug 2.0.14 fixes the following issues: 7954, 7964, 7961, 7956. We’ve been working hard on refactoring existing Firebug 2 features and extensions so, they work together with new Firefox built-in developer tools and support recent platform changes like the new multi-process architecture (a.k.a ‘e10s’). We’ve been also working on a follow-up Firebug 3 (a.k.a Firebug.next) extension that allows us to test features before we land them in Firefox. Firebug 3 contains further popular Firebug features like XHR Console Inspector (aka XHR Spy) and a DOM panel for Document-object-model inspection. The best part of this extension is a new Firebug theme (in addition to existing Light and Dark themes) so, Firebug users can feel like home when switching into Firefox built-in tools. Beta version of Firebug.next is available for download. Note that the XPI is not signed and so, you need to flip xpinstall.signatures.required to false to allow installation. The work on the theme has helped us support existing Firebug users, and also make sure that theme APIs are extensible enough and ready for developers who want to build themes. Firebug 2 doesn’t work in multi-process browsers (i.e. e10s) and converting it is too complex, it will stop working when e10s is activated in Firefox. We want to be ready when Firebug 2 stops working and we have come up with the following plan. Integrate all Firebug 3 features into Firefox built-in tools and forward all Firebug users to it. Replace Firebug 2 by releasing Firebug 3 (on AMO) only if we have to deliver any critical features missing in Firefox developer tools in an extension. We are currently working on porting XHR Inspector (bug 1211525), DOM panel (bug 1201475) and Firebug theme (bug 1244054). Don’t worry if you want to run multi-process browser (DevEdition or Nightly) now. We have introduced transition path that will allow you to move from Firebug 2 to built-in DevTools. See the following screenshot (Firebug 2.0.14). This notification message appears if you are running Firebug 2.0.14 in multi-process Firefox. It allows to open built-in Developer Tools or choose to disable e10s and keep Firebug. The Firebug team released Firebug 2.0.13. This is a maintenance release ensuring compatibility with latest Firefox releases. The beta channel on AMO is not updated due to a new signing process (support for beta channels is currently in open beta phase). It’s recommended to use standard release channel on AMO (if you don’t know what AMO beta channel is, you are most likely using the right release channel). Firebug 2.0.13 fixes the following issues: 7948, 7951, 7952, 7929. The Firebug team released Firebug 2.0.12. This is a maintenance release ensuring compatibility with latest Firefox releases. Firebug 2.0.12 fixes the following issues: 7916, 7922, 7928, 7917, 7923, 7931, 7918.